As it does every year, Valentine’s Day is creeping up at an inexplicable rate. However, we’re not here to stress about last-minute gifts, those pesky fancy dinner reservations, or even the box of chocolates you *still* need to buy for…yourself. Rather, in the time leading up to Valentine’s Day, we’re celebrating our one true love: Netflix. Sure, we’ve had our ups (Stranger Things, Mudbound, everything about Jessica Jones) and some devastating downs (the unlawful canceling of Sense8 and removal of Friday Night Lights) with the iconic streaming platform. But before Netflix began churning out hit TV show after hit TV show, it completely changed the game by introducing us to the concept of binge-watching. By now, binging a TV show has become a routine way to spend a long weekend, sick day, or an excuse to get out of plans. But there was a time where it wasn’t just something we did in our spare time; way back when, binge-watching brought an air of excitement, trepidation, and we were definitely a little nervous that our parents would find out — and cancel the family account due to excessive use. But this Valentine’s Day, Netflix wants to take you back to the magic of those early days and remember your first time — because there’s no binge quite as special as your first. So how do you go back and find your first? It’s actually quite easy. Just find your Netflix account page, click on “VIEWING ACTIVITY,” and scroll…and scroll, all the way down to the bottom. 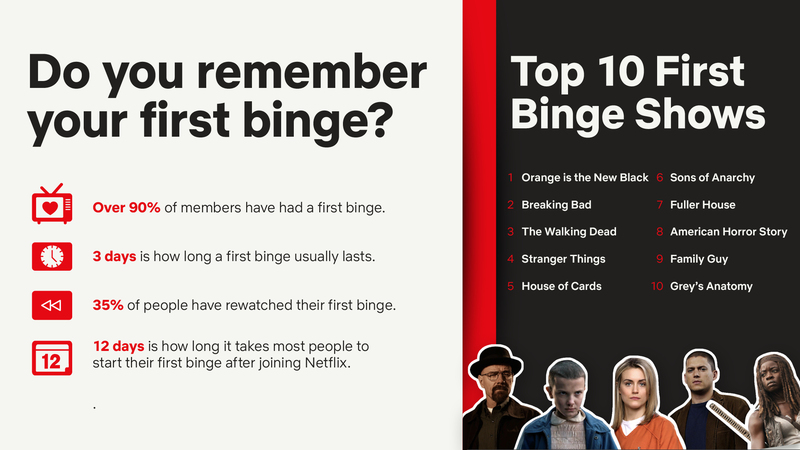 According to new data from Netflix, it takes an average of just 12 days for a new user to start their first binge — and most complete a single season in just three days. Now, before you feel a little guilty about crushing an entire season of Grey’s Anatomy in a single weekend, it turns out that practically everyone else is doing it. The streaming platform revealed that 90% of users who’ve had a Netflix account for at least a year have already taken the plunge and had their first binge. Naturally, the shows that generally serve as people’s firsts are the ones that it seems literally everyone has seen. According Netflix, Orange Is the New Black is the show that most U.S. users binged first, followed by Breaking Bad, The Walking Dead, and groundbreaking originals like Stranger Things and House of Cards. Of course, it can sometimes be hard to say goodbye to your first. Netflix has even found that a lot of people end up going back to their first binge for another round — and we can’t say we blame them. So before you settle in to watch all three seasons of Lovesick this Valentine’s Day, take a moment to look back and remember your first time. Whether it’s still available to stream or not — in which case, this whole thing will be pretty cathartic — you’ll always have those fond memories of staring at your television screen or laptop for twelve straight hours.